The Games Barn is a self catering holiday home in East Sussex with excellent disabled facilities sleeping up to 8 people in 4 bedrooms. It has been rated as a 3-star facility by both Tourism in Britain and , more recently, the AA and has been assessed by Disabled Holiday Information, a charity run for and by those with disabilities. We converted the Barn to a holiday home in 2008 and have enjoyed welcoming very many people of all ages as our guests since then. The Games Barn is located on the edge of the beautiful ancient village of Mayfield in an extremely quiet location on a 30 acre working farm in the heart of the High Weald Area of Outstanding Natural Beauty. The farm has a small number of animals including sheep, pigs, cows, chickens and ducks. The grounds also include a stream with a weir, a wildlife pond and an ancient woodland . The peaceful setting is absolutely ideal for those guests wishing to get away from it all and take a rural break on a farm but is just two kilometres away from the village of Mayfield and all of its facilities and is a short drive from all the main tourist attractions in Sussex, including the south coast beaches. We welcome people of all ages and are happy to let you help us around the farm including feeding and caring for our animals, collecting eggs etc. The flexible accommodation makes it ideal for family reunions and we are very happy to provide extra bedding so you can invite different friends to stay with you at different times (up to a maximum of 8 on any night). The Games Barn is perfect for family gatherings, and is able to accommodate a maximum of 8 people in its four bedrooms (2 double bedrooms and 2 twin bedrooms which can be converted to doubles). It has excellent disabled facilities, making it ideal for wheelchair users (we can supply a wheelchair if required) and those with reduced mobility but is equally suitable for able bodied people of all ages. The dining area seats 8 (we can supply a high chair if required) and opens out onto the decking area. The sitting room features an excellent woodburner (we supply all the wood) and a variety of different comfortable chairs to suit all ages including disabled friendly armchairs. 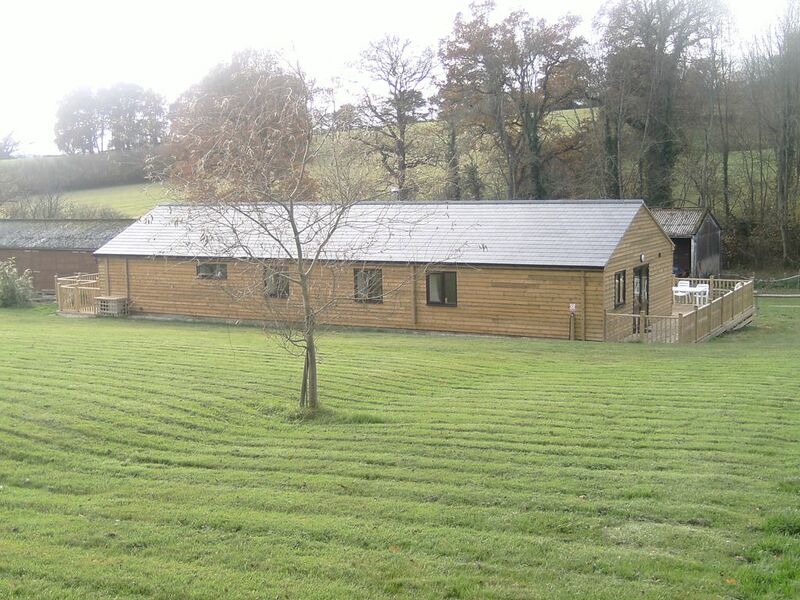 The barn has full mobility facilities including a wet room with sit down shower without a shower basin allowing full wheelchair access and hand rails etc for the toilet area and wash basin. There is level parking with a ramp up to the bungalow. The main doors (front and back) are double size patio doors which open fully. There is a slight threshold on these doors but otherwise once in the barn everything is on one level with no steps. The floors are tiles throughout with rugs that can easily be removed if preferred. Please note the kitchen is a standard size and does not have low work tops for wheelchair users. We have a separate laundry area which includes a washing machine, tumble dryer, iron and ironing board, clothes airer and an outside clothes line. There is an outside decking area with patio furniture seating up to 10 people and there is an enclosed grass area for children (and dogs) to play in. We have Wi-Fi but please note it works at rural speeds!! We allow a maximum of 2 pets but please note we charge £25 extra per pet per week/short stay and we expect you to poo pick!! There are electric heaters in all the rooms. We include 420 units per week of electricity within the rental. If you exceed this usage (very unlikely) we charge 15p per additional unit. We ask for a damages deposit of £150 in cash on arrival which we return in full on the day you leave provided there are no issues. We expect the property to be clean and tidy on departure. We ask for 2 payments to secure the property. The first payment of 25% is a non returnable deposit and reserves the dates for your stay. The balance of the rental is due 6 weeks before the holiday starts. Our terms and conditions explain our cancellation policy in detail but please note the deposit is non refundable but we will refund the balance (if paid) provided we are able to re-let the property for the same dates. We met in 2000 having both been widowed. At the time we both worked in London. Fred proposed in January 2006 and at the time were on the verge of buying a property about 5 miles away that had just 2 acres of land with plans for the wedding reception to be held in a marquee on the lawn. The property fell through just 4 months before our wedding so , in panic mode, Madeleine discovered this farm which had just gone on the market and spent a long weekend persuading Fred it was right for us. The Games Barn was a breeze block ex poultry house but undaunted we decided we could hold our wedding reception in it so we bought it and our house and the 30 acres and have not looked back. We both stopped working in London by 2011 and are now full time farmers (with no previous experience!) It is hard work but, mostly, very enjoyable. We had always wanted to buy somewhere together that would keep us active when we retire (not quite this active but never mind) and this place certainly does that. Our wedding day was absolutely lovely and the venue worked perfectly. The views from our house are fantastic and you couldn't ask for more peace and tranquillity. Having lived on a main road on the Gatwick flight path, this feels like heaven. We still feel as if we are on holiday when, on summer evenings, we can sit out on our decking and watch the glorious sun sets in total peace. Perfect. Nothing here is unique; there are places like this all over the country, but it is so special to know that we are lucky enough to own our personal piece of countryside. All the land we see from our windows is our land - that is special. Both bathrooms are wet room style ; one has a bath and separate shower and toilet but no hand rails. The other is a full disabled shower (no shower basin) with seat and rails plus a disabled toilet with rails and a disabled basin with rails but no bath. Lots of board games - we are called The Games Barn for a reason! We have several videos for all ages but please bring your own as well! Decking area at back of Barn. Seats 10 easily. Sun umbrella and cushions provided. Access via wheelchair is easy. Access to garden area also. No stairs; ramp access to get to the bungalow; small door threshold to get into the bungalow (less than an inch) but then all on one level. Tiled floors throughout with no internal door thresholds. Access to decking area, Parking at bottom of ramp. We have had many wheelchair guests here and they love it. Vetted by Disabled Holidays which is an organisation run for disabled people by disabled people and they are happy to recommend our property. Ideal for families that enjoy a holiday on a farm setting. The grandchildren enjoyed helping to feed the animals and collect the eggs. Good disabled facilities. We greatly enjoyed your company and would love to see you all again. I would like to thank Fred and Madeleine Farbrother very much indeed for creating such an amazing and unique space for guests to enjoy. We felt very much at home, from home. What is also immensely enjoyable is the immediacy of the working farm atmosphere so nearby at hand. Hard work, and we could see that. The meat is beyond excellent. We loved it. THANK YOU!! Thanks so much for this lovely review. We greatly enjoyed your company and are very pleased you had such a great time. There are many National Trust properties in and around East Sussex and Kent. Mayfield village is steeped in histopry and we are close to the historic towns of Hastings, Battle, Tunbridge Wells and Tonbridge. We are close to both Eastbourne and Brighton which offer a wide range of activities along the sea front. Druscillas zoo is about 15 miles away.